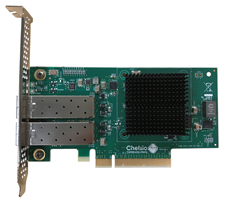 Chelsio 1/10/25/40/50/100GbE iWARP adapters enable high virtualized application performance by giving direct access to the data residing on hyper-converged or disaggregated Storage Spaces Direct storage, as well as higher scalability for Storage Spaces Direct (S2D). Chelsio iWARP adapters work with any legacy Ethernet switch, thereby enabling incremental Windows Server 2016 installations without requiring a concurrent forklift upgrade of the switch infrastructure or the entire datacenter. This ability allows the use of most cost effective new or existing switch infrastructure with the least amount of support, while enabling an immediate plug-and-play deployment. This enables much more streamlined and simplified configuration of RDMA high-performance networking for Microsoft S2D compared to other Ethernet RDMA networking alternatives. Microsoft recommends iWARP as the safer alternative for S2D  as it does not require any configuration of DCB on network hosts or network switches and can operate over the same distances as any other TCP connection. For more information, refer the below article.